This is an exciting milestone, and it is Microsoft’s perspective that this underscores our global leadership and its relentless commitment to innovation, agile execution, and visionary roadmap to deliver high-value to customers and partners in a constantly changing market. High value| Users can start free with Power BI Desktop. Organizations can then choose to license users individually at a low monthly cost or extend business intelligence broadly with Power BI Premium—purchasing only the capacity that’s needed. Since Power BI integrates with their existing tools, it’s instantly familiar and quick to transition. Centralized management | Organizations can deploy in minutes and distribute BI content with just a few clicks. They can take advantage of the agility of self-service analytics with IT governance from Power BI. Global scale | Organizations have the flexibility to deploy their BI solution where they reside with global presence. 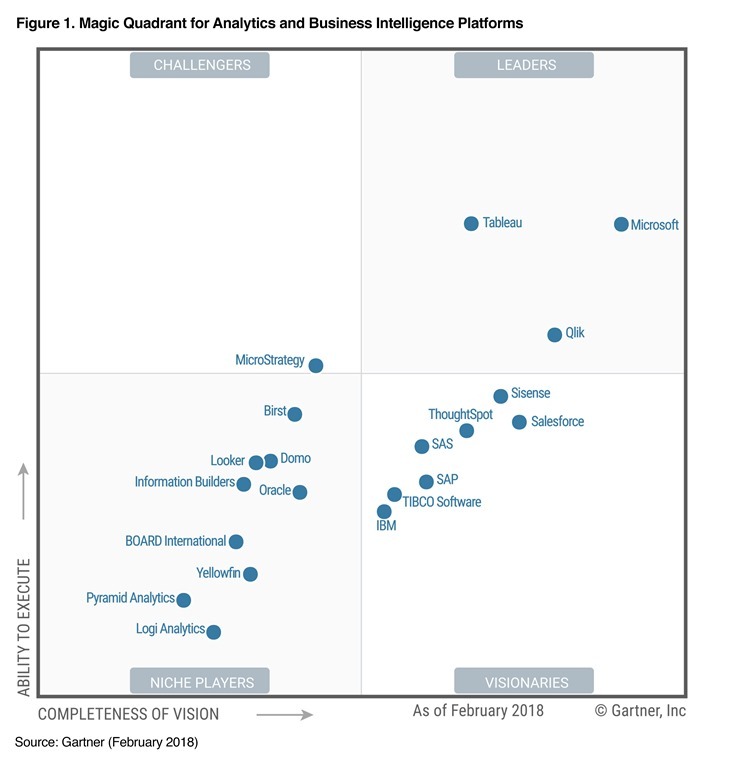 Power BI provides guaranteed reliability and performance from a trusted company. You can see the new AI-driven analytics and data storytelling capabilities driving these results in action watching the latest episode of Microsoft Mechanics. Finally, and most importantly, we remain committed and inspired by the great feedback and engagement we see from our community around Power BI. Since July 2015, our engineers have worked hard to listen and incorporate feedback from more than 200,000 active community participants who have submitted over 6,000 ideas. This level of input has directly influenced the evolution of our product. Also, with more than 250 showcased solutions, our partner network brings a wealth of experience across a wide number of industries, technologies and geographies. Thanks for being a part of our journey and vision. We look forward to driving even greater innovation, progress, and value in the data visualization, exploration and insights space. Get the Gartner’s 2018 Magic Quadrant for Analytics and Business Intelligence Platforms * report to learn more about Microsoft’s leadership in the industry. Attending the 2018 Gartner Data and Analytics Summit at Grapevine, TX? Learn more about our sessions and request a meeting.